Sick, Stressed, and All F*cked Up: Is CBD the Cure? Page Two Books, Inc., 9781989025383, 240pp. 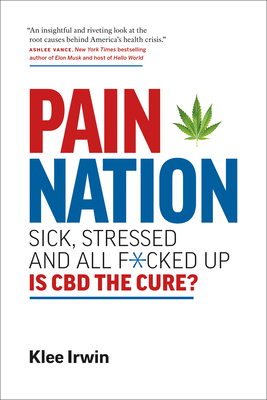 A brilliant, original exploration of how the CBD revolution is going to transform Americans' lives. We are an anxious and uptight nation on the brink, divided by a broken political system and a president who is pushing us over the edge. Many of us are agitated about terrorism, guns, religious fundamentalism, and refugees. With only 5% of the global population, we consume 80% of the world's prescription opioids, antidepressants, and amphetamines--addictive drugs prescribed by medical doctors and known to cause paranoia, homicidal tendencies, and psychosis. Even those who aren't prescribed these medicines are accessing them--think kids using their parents' medication--with disastrous results. Those who can't access opiates through legal means are finding them on the street, resulting in an opioid crisis with overdoses on the rise. The United States has the highest level of suicide in the world. We're stressed, both mentally and physically. We're a nation in pain. How do we deal with this pervasive sickness? CBD (cannabidiol), perhaps the most profound plant medicine ever discovered. Extensive research over the last decade shows that this miracle molecule of the cannabis plant helps with countless medical conditions like nothing we've seen before (and no, it can't get you high). CBD has a proven effect on everything from chronic pain and epilepsy to anxiety and depression. In this provocative book, Klee Irwin makes a compelling case that we should stop being afraid to try this plant medicine. CBD could be the answer so many Americans are seeking. Klee Irwin is the founder and Executive Chairman of Irwin Naturals, an award-winning global natural supplement company providing alternative health and healing products to over 90,000 retailers across the globe, including Whole Foods, Vitamin Shoppe, Costco, RiteAid, Walmart, CVS, GNC, and many others. Irwin Naturals is a long-time supporter of Vitamin Angels, which provides lifesaving vitamins to mothers and children at risk of malnutrition. Irwin is active in supporting students, scientists, educators, and companies working to create positive change in the world. He is the founder and director of the non-profit Quantum Gravity Research. As an active angel investor and donor, he has invested in or supported organizations such as the X PRIZE Foundation, Singularity University, The National Academy of Medicine, Moon Express, Change.org, Upworthy, Donors Choose, and the Hero Science Foundation. Irwin splits his time between his hometown of Los Angeles and his favorite place to be: Hana, Maui.